The event Cooper describes happened in 1957. At that time, he was one of the best test pilots at the Edwards Air Force Base in California. He also managed several other projects belonging to the Experimental Flight Test School at Edwards and his credibility has never been called into question. On May 3 of that year, he had his crew of engineers setting up an advanced photographic system that took one frame per second pictures of aircraft landing. The location of the system was a dry lake bed and the weather was clear. The engineers had begun work early in the morning and were equipped with both still and motion picture cameras, in order to provide additional footage. 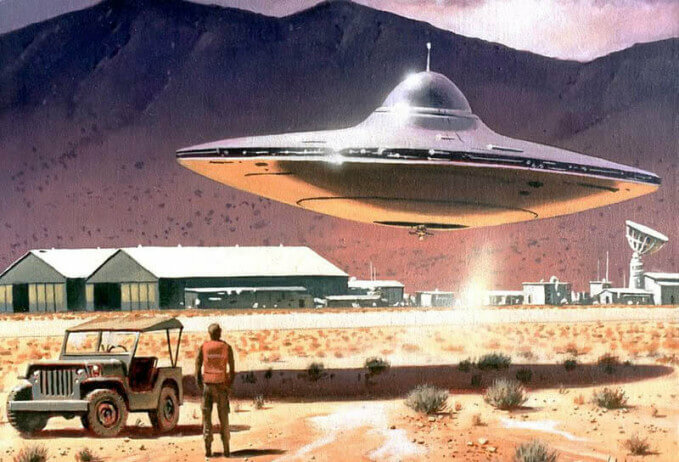 At a little pask 10 a.m., crew members James Bittick and Jack Gettys returned to Cooper saying they had witnessed a “strange-looking, saucer-like” craft that was dead silent during both landing and take-off. This aspect worried him, as there was no known, man-made aircraft capable of such a feat. He also knew and trusted his crew and they were all experienced cameramen who wouldn’t have been easily mistaken. Cooper decided to follow protocol and called a special Pentagon service to report the incident. He was instructed by a general to have the film developed and immediately send it via military courier. The high-ranking official specifically asked Cooper not to make any prints of the film. He did not, however, say anything about looking at the photo negatives. He didn’t say anything about me not looking at the film. That’s what I did when it came back from the lab and it was all there just like the camera crew reported,” Cooper said. The photos were of excellent quality, as one would have expected of a team specifically trained in aircraft photography. Unfortunately, Cooper never got a chance to see the film reel before it was sent to the Pentagon. During the following weeks, he expected to be contacted as part of an investigation of the event. After all, an aircraft of unknown origins had landed in one of the United States’ most classified military base. But it never happened, and, despite his best efforts, Cooper was unable to track down the photos. Right up until his death, the former astronaut maintained his beliefs and claims. In his memoirs, he wrote about the other unexplained aircraft he had witnessed throughout his career and also mentioned the existence of hundreds of similar reports. It started in World War 2, when the government didn’t want people to know about UFO reports in case they panicked. They would have been fearful it was superior enemy technology that we had no defense against. Then it got worse in the Cold War for the same reason. So they told one untruth, they had to tell another to cover that one, then another, then another… it just snowballed. And right now I’m convinced a lot of very embarrassed government officials are sitting there in Washington trying to figure a way to bring the truth out. They know it’s got to come out one day, and I’m sure it will.